Caste prejudice thriving in Telangana? Though Madhavi's father claims he's not against inter-caste marriages, experts and activists have reasons to believe caste pride is ruining lives of many in the State. Sandeep and Madhavi, were attacked by the bride's father. HYDERABAD: Sandeep and Madhavi fell in love five years ago. While she hailed from a Brahmin family, her husband was Dalit. They met while appearing for Class-X Board examination. 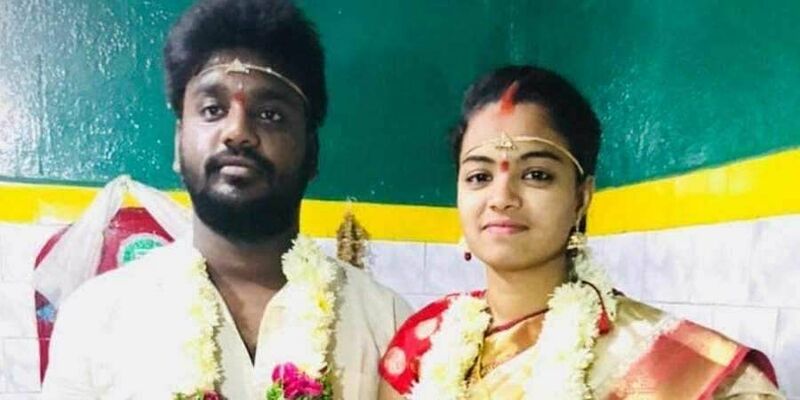 The couple tied the knot on September 12 at a temple in Hyderabad. Since then, they held two meetings with the girl’s parents, but both ended on a bitter note. Madhavi’s mother even claimed she had ‘disowned’ her daughter. The couple then went to SR Nagar police station and the sub-inspector. He then called their parents and counselled them, saying they were majors and had the right to make their life choices. The SI told the parents not to trouble them. West Zone DCP AR Srinivas claimed that doctors had assured that Madhavi will recover from the attack. A case of attempt to murder has been filed against Manohar Chary. Cops say his intention was to kill his daughter. While Manohar is allegedly a drunkard, Sandeep and Madhavi are still pursuing their graduation. Sandeep worked at a hotel on part time basis and earned about `200 a day. “Manohar used to drink and come to our house every evening and plead with us to take care of his daughter,” says Sandeep’s brother B. Madhu. “We did not have any kind of objection to their marriage. In fact, we were treating Madhavi as our family member. While her mother disowned her, her father used to get drunk and plead with us to take care of her. We did not see this attack coming,” says Madhu, asking the government to act. 44 year-old Manohar Chary confessed his guilt before the police later on Wednesday. “He was fully drunk when he assaulted them and was unable to talk properly when he landed here,” says DCP AR Srinivas. “While he has confessed to the offense, there is no honour killing angle here. Cases for attempt to murder and SC/ST atrocities have been registered against him,” the officer said. According to the cops, Manohar claims to have attacked the couple for two reasons. 1) For getting married without informing him 2) As his daughter refused to ‘come home’ with him. “Manohar Chary has said that caste was not a reason for the attack and, in fact, he was not against such inter-caste marriages,” Srinivas said. “Manohar had been drinking for the past five-days. When his Blood Alcohol Concentration (BAC) was checked at around 7 pm Wednesday, about three hours after the attack, it was around a whopping 357,” said the officer, adding that Manohar had taken the machete from a tender coconut vendor. Does media have a role? “I thought my son Pranay would be the last one to die due to caste. I was hoping this would not continue,” says P Balaswami, whose son was killed over inter-caste marriage. Adding to that, Pranay’s wife Amrutha Varshini said: “Parents need to put their daughters happiness and right to choice ahead of what the society may talk or think. Their pride should not decide our lives,” she said.